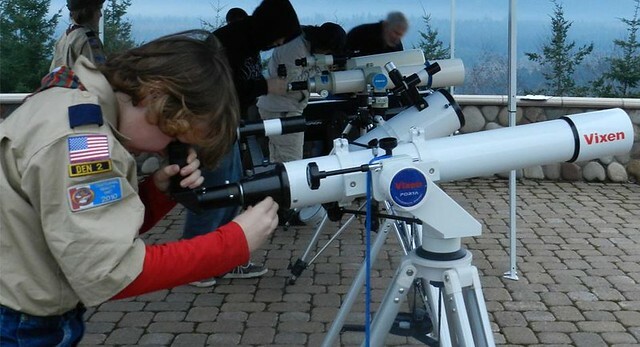 Scout out the George Observatory on February 2: Cub Scouts earn Astronomy Belt Loop and Pins in one day! What are your Scouts doing next weekend? We have an idea! Bring your Cub Scouts out to The George Observatory on Saturday, February 2 to earn their Astronomy Belt Loop and Pins in a single day. Hands-on activities taught by staff astronomers help Scouts enjoy completing their requirements, which include: learning how to focus and diagram a simple telescope, making and using a star map, and interviewing an astronomer. Scouts will also get a tour of our large research telescope, in addition to learning astronomy concepts in the Discovery Dome portable planetarium. Can’t make the February date? Don’t fret; we’ve got another day for Scouts coming up on April 20. Space is limited, so reserve your tickets in advance by clicking here. When: Saturday, February 2 from 1 to 3 p.m.
How Much: $15 per Scout + standard $7 park entrance fee for everyone over 12 years old. Stay awhile and explore beautiful Brazos Bend State Park with a picnic after class. Tickets to view the night sky through our telescopes — weather permitting — go on sale at 5 p.m. For more information on The George Observatory and Brazos Bend State Park, click here. Peggy is the Director of the George Observatory. “When I first came to George Mason in the 1980s as a graduate student, . . . I started a petition for an observatory,” Geller said. “We were promised a telescope on top” of two now-built science buildings on campus. Next Post Educator How-To: Make your own Fabergé — ahem, Faux-bergé — egg, complete with a tiny surprise!